Whiskey Flats was recommended by a friend and I'm glad we were able to work with Nai and her team. 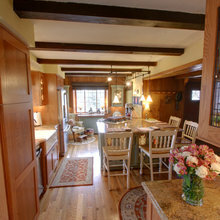 We originally wanted to renovate our last home and WF came up with a beautiful, functional design. With her professional advice and even though she wasn't able to take on the renovation, we eventually bought a new home that Nai helped us to decorate. She helped us stick to our budget and did a lot of work behind the scenes to ensure that everything was delivered within two months of us moving in in time for a party we had planned. She also helped us to place a lot of our existing pieces so that we didn't have to do a complete overhaul. She was easy to communicate with and was a pleasure to work with. Thank you for the review. I thoroughly enjoy working with you and always look forward to seeing you and your family. You purchased a beautiful home that is very suitable for your growing family and it was a pleasure being a part of that transition in your life. Whiskey Flats Design Firm is a very knowledgeable company and knows what they are doing and will gets the job done, very professional and gives great advice and ideas. When we moved to East Texas my husband and I thought we would have to hire an architect from Dallas. However, our realtor recommended Whiskey Flats and we could not have been happier. Nai was so easy to work with, took our suggestions and made them a reality. Also, she has so much experience that she had a lot of recommendations for getting the most use out of the space and she was right! The house has turned out more beautiful than I could have ever imagined. I feel truly blessed to have worked with such a professional company. Whiskey Flats came highly recommended by a friend who also has his home redesigned. We had a great experience working with Nai and company. They designed a total transformation of our 80's ranch style into a contemporary home. Their attention to detail, professionalism and communication were key to the success of the project. I can't stress enough the importance of their professionalism and communication, just made the experience more enjoyable and allowed us to make better decisions. We all enjoyed this project and love the great review! It makes us feel so good to have the ability to bring something to life for a client and know they are enjoying their new home. Whiskey Flats Design Firm, headed by Nai Lam, will create a space with your vision in mind. They will fight for your rights as a homeowner and help protect your investment as they did for me. As a first time homeowner I purchased an older home with the intention of remodeling the kitchen, 2 living spaces, and 1 formal dining. I wanted to bring my home into the convenience of modern world while maintaining the warm comfort and charm of older neighborhood/homes (1964) - Whiskey Flats did that and so much more. I now have an open concept space that I can easily entertain guests - Custom kitchen with more cabinets space than ever thought possible - fought my battles with contractors, hardwood floor manufacturer, and paint company - all of respective companies were at my house offering solutions to me instead of telling me what I did wrong over the phone/email. Finally, the design team really protected my home from the worst culprit in my modeling project, which I'd have to admit, was myself - they managed my budget, scope, and expectations while producing what was really important to me. I will highly recommend Whiskey Flats Design to anyone that will listen!